Five different programs under two different decades-old trade statutes apply, Zarcone said. “Taiwan is not deemed to be China,” so LKQ wouldn’t be affected by the China-specific tariffs, Zarcone said. 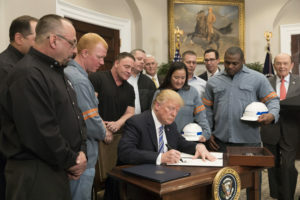 But “very little detail” exists on the Section 232 proposal by Republican President Donald Trump to slap country-by-country tariffs of up to 20-25 percent on automobiles and auto parts, Zarcone said. A tariff on Taiwan here would be LKQ’s “biggest exposure,” he said. A tariff on auto parts would affect some OEM parts as well. Nearly all the major OEMs build cars abroad and import them to the U.S. — including domestic producers FCA, General Motors and Ford, Bloomberg reported May 31 citing LMC Automotive Data. As for other tariffs, Trump administration’s steel and aluminum action has “really no impact,” as it relates to raw material, according to Zarcone. The first round of the administration’s Section 301 tariffs affected a few dozen LKQ products, for less than $5 million in impact, he said. The proposed Round 2 would have minimal impact, but Round 3 has the “possibility” to affect LKQ, as it would impose a 10 percent surcharge on more than 6,000 items, he said. The Round 3 tariffs would probably be felt the most by the LKQ subsidiary PGW, since many of its aftermarket windshields come from China, according to Zarcone. Earlier in the call, after mentioning the three tariff statutes cited by the Trump administration and discussing the minimal impact of a Section 301 U.S.-Canada trade spat, Zarcone discussed pricing. If prices were to inflate because of tariffs, “we, like many other domestic distributors exposed to tariffs, expect to pass along these increases to our customers,” Zarcone said. It was unclear if his comments were related to solely the Canadian situation or tariffs in general. During the same call, Zarcone described an effort to keep North American parts and services margins healthy not by raising prices but by ensuring LKQ’s sales team wasn’t granting too large of a discount to repairers who didn’t merit it. In other sourcing news, Zarcone said that “importantly,” the company’s aftermarket SKUs grew 5.7 percent in the second quarter, while its number of certified parts grew 12.6 percent.